I have argued for changes to the policy on id-cards [...] I would characterise my position as certainly wanting a Labour government, but a better Labour government, and one which I think many in Cambridge would support. I was surprised to see Zeichner say that he has argued for changes to the government policy on ID cards as in June 2007 I watched him defend ID cards at a No2ID meeting at Parkside; there he appeared to me to be taking a position indistinguishable from that of the Government. He has written to me to explain his contribution to that meeting as being due to him explaining the governments position rather than expressing his personal agreement with it, but didn’t enlighten me as to what he personally thinks. I wanted to find out exactly what his stance is and how it differs from the Labour Government policy. When asked to clarify his views Zeichner stated that he thought ID-Cards were essential to tackle immigration and illegal working by foreign nationals. He said that neither he nor the Government had any intention to make them compulsory. I pointed out that the government was making ID Cards compulsory for increasing numbers of people, including many foreign nationals. The fact that UK citizens wanting to travel, and so needing to renew their passports, would find themselves being added to the national identity database was also put to Mr Zeichner. It was argued that requiring those applying for new passports to be placed on the national ID database amounted to a degree of compulsion, or at least forcing people to choose between travel or an entry on the national ID database. I asked Mr Zeichner why passports were insufficient for tackling immigration, and how an ID card would be better. Martin Lucas-Smith asked Mr Zeichner if he had any argument for the use of ID Cards outside of the limited areas he had mentioned of immigration and foreign nationals working illegally. 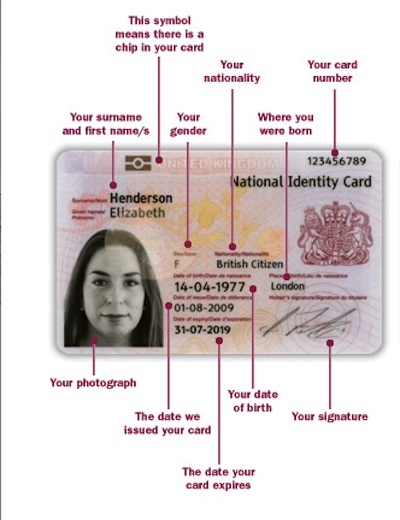 In response Mr Zeichner essentially said “no”, it appeared he had simply not considered the fact that the ID Card and associated database is a multi-use system which goes far beyond the functions of a passport / visa. I raised the range of new ID Card related offences, including hefty fines for those who fail to tell the passport and identity service of changes in their personal details; Mr Zeichner tried to laugh this off as an irrelevance. I suggested that if Zeichner didn’t want to see ID cards used in other areas such as health, policing, or local government then he and his party ought consider legislating to prevent those organisations requiring the cards or using the database. Martin Lucas-Smith pointed out that allowing the card and database to be used by a wide group of public bodies would mean a large group of people having access to the database, potentially leading to security problems. The greater the number of individuals given access to the database the harder it will be to enforce restrictions designed to prevent the release of information stored on it. The more organisations able to change the information held on the database, the harder it will be to provide an assurance the information held is accurate. Zeichner briefly raised the suggestion that ID cards can have a role preventing terrorism, but didn’t explain how they would fulfil that role or answer points noting that terrorist acts are committed in countries with ID cards. Talking about the national ID database, Mr Zeichner said he worked in IT (he’s been a “political officer” for the trade union Unison since 2002), and thought that databases were now a fact of life, he cited the information which supermarkets keep on those using loyalty cards. I argued that having one national state run database was very different from databases held by companies, or even those held by individual arms of the state. I explained I didn’t want to see all my eggs in one basket when dealing with the state, I don’t want mistake by one agency affecting all aspects of my life. Mr Zeichner said he was willing to look at the question of if there was a need for an ID Card and national ID database, and implied he hadn’t considered at all the reasons for doing more than simply introducing a robust passport and visa system [which with exit controls I believe would enable immigration policy to be enforced]. Mr Zeichner is considering if he will support an ID Card system to be used for purposes other than as a passport/visa. When it was put to Mr Zeichner that Cambridge was a relatively liberal place with a lot of opposition to the increasingly oppressive state we have seen the current government bringing in he appeared to if not agree with the liberal sentiment, at least recognise it, and said he would try to reflect the views of Cambridge residents if elected. Bringing our discussion on ID Cards and the national ID database to a close Mr Zeichner said that we were were putting forward an intellectual argument which wouldn’t resonate well with those he meets on the doorstep; with “those who have trouble reading The Sun”. He said such people, who he apparently feels will vote for him, have concerns about immigration and illegal workers, and support ID cards as a way to address their concerns. When reminded of his strongly pro-government and pro-ID Cards speech at the June 2007 No2ID meeting Zeichner said he thought that the electorate would find the fact that he was prepared to get up and defend the government’s position in a room of two hundred people holding the opposite view as a strength for someone standing to be the city’s MP. It appears that Mr Zeichner is as yet unsure of the position he will take on ID Cards and the ID database if he is elected to represent Cambridge. I think that as ID Cards, the national ID database are key Labour government policies so even if he is personally wavering he will be likely, when it comes to voting, to support his party’s position. One thing to watch out for will be an attempt to take a nonsensical and inconsistent position such as that now taken by David Blunkett, the Labour Home Secretary who introduced the scheme in the first place. Blunkett’s current stance is presumably aimed at pleasing everybody but amounts in reality to being at best indecisive or at worst misleading. I don’t think we need, or can afford, a national ID card system and a national identity database. I do not think that money and effort spent on those extravagant national projects is best targeted to keeping us safe and enforcing immigration laws. I am very worried by the increasingly oppressive nature of the UK state. During the debate itself a member of the public asked what the candidates’ core political beliefs were. After Julian Huppert had espoused his commitment to liberal values, carefully name checking Shami Chakrabarti as he did so, Conservative Nick Hillman said: “we’re all liberal minded people here, I think we were all at the No2ID protest the other day.” Mr Zeichner though certainly didn’t attend the protest against Home Office Minister Phil Woolas’ planned visit to the Cambridge to launch ID cards for foreign nationals. I want to see Cambridge send someone to Parliament who will fight against the increased erosion of civil liberties by the state. This entry was tagged Hillman, NO2ID, Zeichner on February 15, 2010 by Richard Taylor. Zeichner’s line about supermarket loyalty cards smacks of the most astounding cynicism. I don’t mind Tesco’s knowing what beer I drink or which magazines I read – if I did I would choose not to use my clubcard. It’s entirely different to the compulsory ID card scheme being proposed by the govt. Zeichner’s long spiel at the start about why Labour would almost certainly lose even if there were a hung Parliament said to me that he had been given the role of PPC in the full expectation that Labour, and probably he, would lose. Given that the unions are eyeing Labour hungrily, I wonder if he’s been offered something in exchange? I don’t quite see how the fact that Daniel currently works for Unison means he hasn’t worked in IT. He has in fact had a long career in that sector and it hasn’t changed sufficiently since 2002 for all that experience to be irrelevant. I did not say that Zeichner had not worked in IT. I reported that he said he worked in IT; I was able to add to that and give a fuller picture of his background by also noting that he has worked as a political officer for Unison since 2002. I do not know how much, if any, “IT” his Unison role involves. I have simply reported what he said, and added another fact providing additional context. Daniel Zeichner very kindly agreed to speak FOR The Database State at a debate I arranged in Tunbridge Wells, Kent. Why such a distant (nearly 100 miles across central London) proponent when there were nationally-reknowned Kent and Home Office committee MPs supposedly passionate about the ID scheme, on Tunbridge Wells’ doorstep? Well – because although all these were courteously invited, NONE was available, nor – despite early indications to the contrary and much contact, was Meg Hillier’s office willing to put her or anybody else up to speak for ID. Draw your own conclusions. I was very grateful to Daniel for stepping onto this lonely podium – he seems a thoroughly decent chap to me – but you have to wonder where the conviction support was, behind him. I told Daniel in 2008 that the stance that the card is “voluntary” is untenable because if voluntary it cannot work. Daniel replied that he thought it could. However, the reality has proven to be that the word “voluntary” is a lie – it applies to those who volunteer not to travel abroad, and doubtless in future volunteer not to receive certain state benefits which will de facto require use of ID card. In other words, the “volunteer” argument is not only dishonest – it is horribly cynical and, I suggest, is seen to be utterly cynical by mainstream media such as the Today programme. We’re not completely stupid! The reasons (supposed benefits) given by government for the ID database have always been fundamentally dishonest. This is why the reasons changed from year to year: as each supposed benefit was exposed as fatuous (e.g. fighting terrorism) a new lie (e.g. illegal immigration) took its place. The worst of all this is that we were systematically lied to and taken for fools simply because we, the electorate, could not be trusted to reach the right decision democratically: that a loss of personal privacy, a shift of boundary between state and private individual, was justified by the added convenience to government (the true reason) in its incompetent operation of state functions. We, the electorate, would never have seen that state convenience as adequate excuse for the attendant loss of civil liberty. The government knew we would not – and so they lied to us about the true reasons. Further, given that the measure is demonstrably ineffective and even counterproductive (generating worse security risks) – it is clearly a doomed fix for underlying incompetence in the handling of those functions, which should not be bolstered by measures reducing civil liberties, but should be fixed properly. No-one in industry would fix management problems by putting another layer of crap over poor management – they would fix the poor management. Given the frequency of occasions when leaving the UK my passport is NOT checked by UK government officials but is checked only by commercial airline employees, it would take a special kind of naivety to believe that the cause and solution of appalling immigration management lies in an intrusive electronic system. It lies in applying the most basic common sense and routine to the problem – checking and recording when an individual leaves. No amount of pork barrel for the IT industry and sound-bite technology fixes make reparation for poor security intelligence. Likewise we employers know we must check Right to Work, and we do a much better job than does the Home Office in employing cleaners and security people – we don’t need another useless bit of plastic which WILL be forged in addition to passport and work permit. Thankyou. Do your own job properly before telling us, who do, how to do ours. The mentality can be seen in the desire to automate recognition – an open invitation to people cleverer than the government’s pork-barrel IT contractors, and ignorance of experts’ advice that this doesn’t work. The appeal to terrorism and immigration to the man on the doorstep who has “difficulty reading the Sun” lacks is intellectually dishonest. We should argue for what is right, not for the rabble-rousing and dishonest appeal to ID as a panacea for terrorism, immigration and crime. I am disappointed that the government have not so far taken cover from the recession as an excuse to can the ID scheme – it is a unique opportunity to slay this monster but save a little face in the process, if political face-saving is more important than honesty. Also, Daniel himself presents a paradox – he seems a perfectly decent chap and no fool – but we, the electorate, see ourselves as being taken for complete fools. We’re not – we’re cleverer than the government.